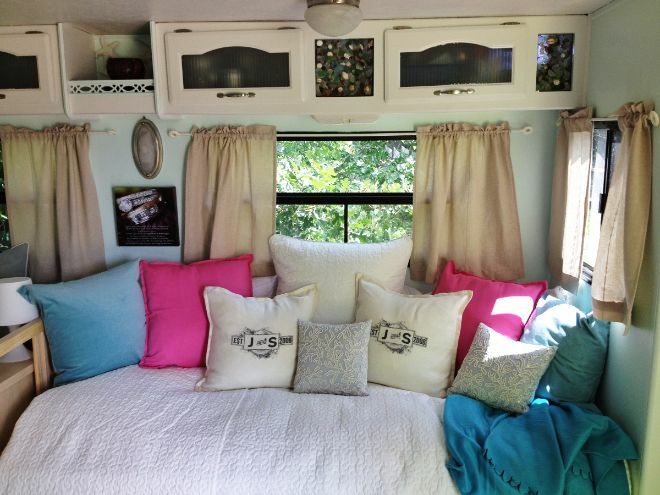 This fifth wheel has been transformed from a dated trailer to an airy, pastel beach inspired retreat. 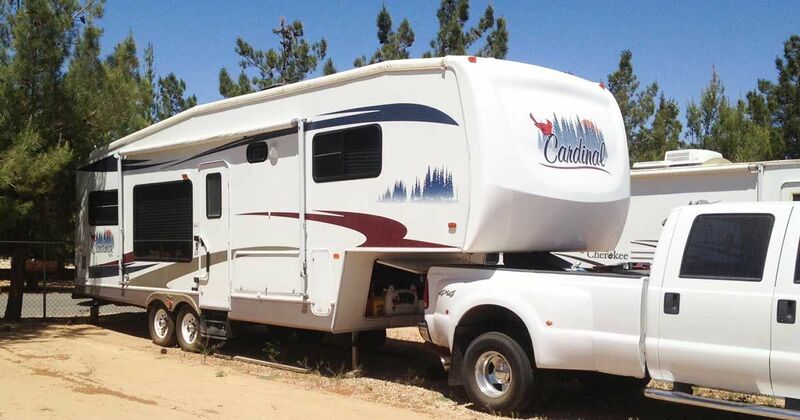 Before the renovation this fifth wheel was just a shell of wood paneling and bland boring decor. Besides lacking character this trailer was also dark, so the bloggers behind Follow the High Line took the opportunity to make it their own and brighten it up. Now it's filled with pops of color, crisp whites, and splashed with a beautiful pastel blue that makes this space feel wide open. Stepping inside you won't believe how big they've made this trailer feel - the kitchen alone is going to surprise you. Take the tour and see for yourself. The outside of this fifth wheel looks just like a shell. You can't even imagine the retreat you're about to step into. 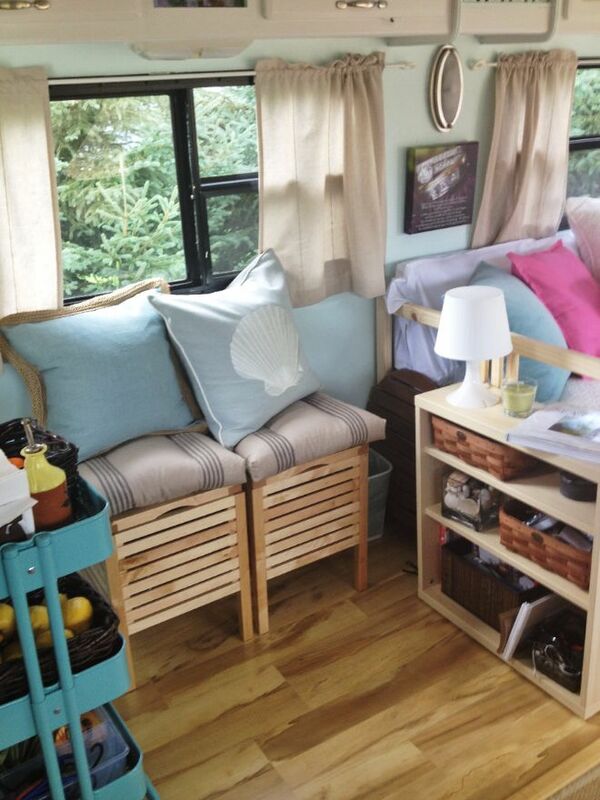 With pastel blue walls, plenty of puffed pillows, and pops of color - this trailer feels like a little hotel suite by the seaside. We also love the creation of this little sitting area by the window despite the small size. This couch is the perfect spot to curl up with a good book after a long day of adventuring. The white cabinets above also really pop against those cool blue walls, and give this tiny space a load of extra storage. 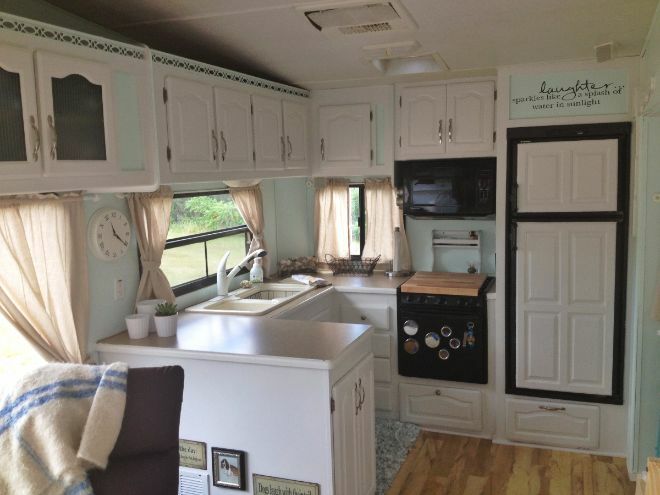 Can you believe this is a trailer kitchen? Check out all that space! There's ample cabinets, a full sized refrigerator, and a big beautiful sink. We love the country white against those neutral countertops - and all the light those windows let into the area. Finally, the bedroom. The way they've maximized space in this trailer is truly amazing. There's a big beautiful bed covered in soft linens and more of those puffy pillows, as well as plenty of storage and room to walk around. The light colors and clean design keep this room, and the entire trailer feel wide open. SHARE this beautiful renovation with someone who needs some inspiration.